I have three fantastic horses to compete on - my old faithful schoolmaster, Indi and my younger horse, Taurus III and from May 2010, Westpoint First of Many is on lease to me from the Palmer family. Likes: Food - and more food! Breeding: Dutch bred. By Havidoff. Taurus III is known as 'Trevor' at home - it really suits him! Breeding: Irish bred by Cloughjordan Bo TB. BD Points: Lots but he's been downgraded so I can do Elementary tests. Dislikes: The only thing he’s not too keen on is large lorries when hacking out. We met Indi’s owner, Sam Smith (Sargeant), when we enquired about a 5 year old pony she had for sale. She realised that Indi would be more suitable for me than her other pony and offered him on loan, which we gladly accepted. We have since been lucky enough to buy Indi. Indi is very well trained and has impeccable manners. He always tries hard and is a pleasure to ride and look after. 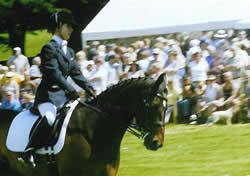 I will be competing in Elementary level tests and a number of Para dressage competitions with Indi in 2008. Indi used to be a WHP before he became a dressage horse. 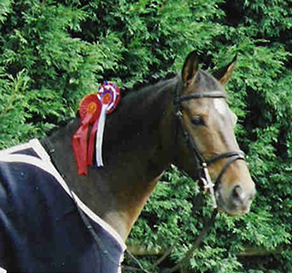 Indi won the Open Elementary Class at the Patchetts Area Festival in 2004. Although he's Irish bred people often think he looks like a German pony. Indi is the most polite horse I’ve ever met and the only naughty thing he does is to be refuse to be caught sometimes - but he can't resist a handful of polos! Indi got laminitis on New Year's Eve 2007 - luckily he has made a full recovery. Despite not having the typical breeding of a dressage horse, Eliza is very supple, active and forward going and is a pleasure to ride. She has a super temperament and is quick to learn. She was on loan to me from Laura Brittain. I competed on Eliza in Austria in May/June 2007 and in BD elementary classes. I had her on loan for 6 months before she went back to her owner. Sadly we decided that Winnie was not the horse for me so she has gone to a new home with young rider Leanne Howe. Winnie is a lovely, talented horse so it was a very tough decision to let her go but I'm sure Leanne and Winnie have a great future together. 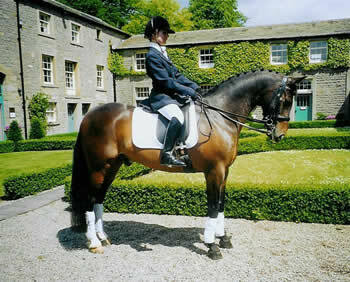 Breeding: Hanoverian by Weltregent. Click here to see Winnie's breeding lines. Dislikes: Playing out in the field for more than half a day. 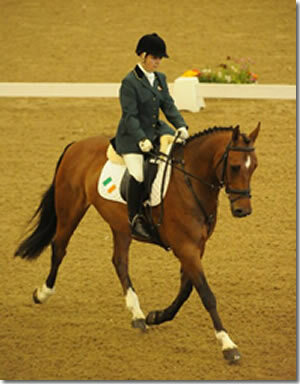 I owned Winnie since October 2004 and my aim was to compete on her at the 2008 Paralympics. 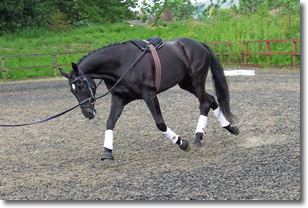 She has lovely paces and a very sweet temperament and we all think she is very talented. 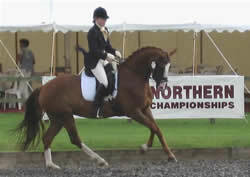 Hannah Moody helped with her education and qualified her for the BD National Open Novice Championships in 2005. I bought Winnie from Melanie Phillips of Ruxton Horses. She was born in Germany and imported to England when only around a year old. Visit the Schwartze Hof website to find out more about her sire. 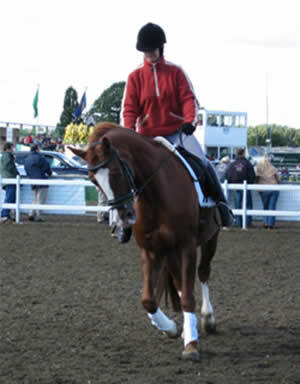 I found Winnie on the internet on www.horsequest.co.uk.